Magnetic Resonance Imaging (MRI) machines are one of the most important medical breakthroughs of the past 50 years. MRI researchers were awarded the Nobel Prize in Medicine for discoveries contributing to our use and understanding of this incredible technology. These highly sophisticated machines can cost in excess of a million dollars each, and today over 36,000 MRI units are installed in healthcare facilities globally. The MRI machine is a vital tool in the diagnosis and treatment of a wide range of diseases for any hospital or healthcare facility. It is not an overstatement to suggest that access to an MRI machine could save your life. For example: survival rates (+5 years) for sufferers of ovarian and breast cancer, when diagnosed at the earliest stage, are as high as 90% compared to 5% and 15% when diagnosed at the latest stage. With an impact of this magnitude, it’s not just critical that MRI systems are fully operational; it could be a matter of life and death. 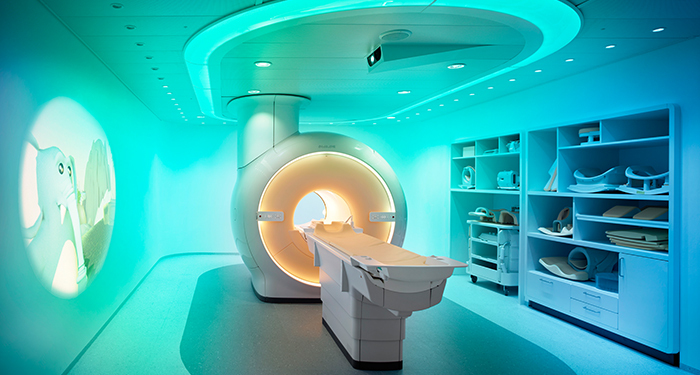 Philips is a respected and globally recognized brand, and a leader in MRI technology. Their healthcare division alone employs more than 37,000 employees in 100 countries. Maintaining maximum MRI reliability, quality and uptime is a priority for their engineering teams. In particular, the cryogenic systems are critical to support the health of a supercon magnet. To ensure the best possible service Philips healthcare engineering team recently launched the Philips e-Alert, an intelligent tool that allows healthcare providers to monitor imaging and diagnostic equipment such as MRI machines. 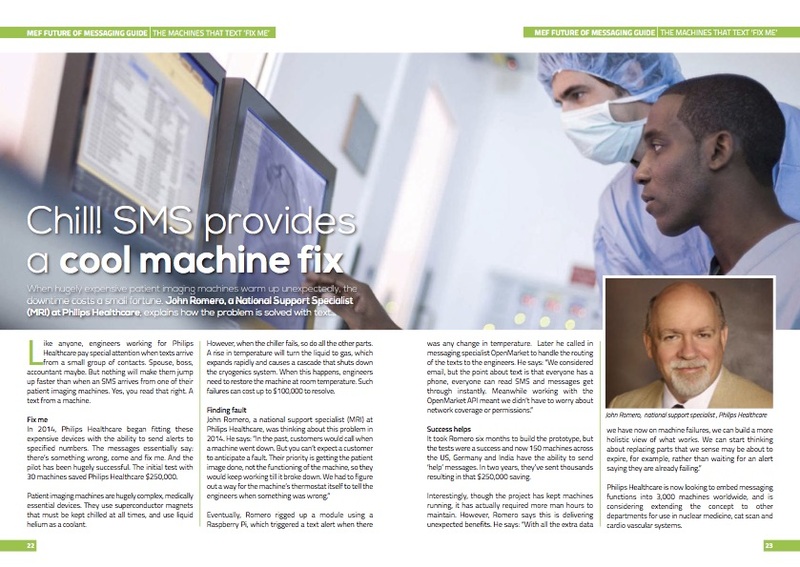 It combines remote sensor technology with the global reach and reliability of SMS (text messaging) to sense and rapidly respond to potential issues, reducing downtime and repair costs while improving patient care. In the case of an issue, Philips e-Alert immediately notifies the relevant staff and engineers to ensure a quick response so that any problem can be fixed quickly. This proactive approach helps identify issues before they can impact a healthcare facility’s operations and can limit downtime of key equipment. Philips’ e-Alert solution places an emphasis on rapid response and resolution to ensure that potential issues are addressed as quickly as possible. Due to the urgency of the alerts – suggested response times range from immediate to within 24-hours – it’s imperative that these messages are delivered reliably and read quickly. Text messaging was chosen as a delivery mechanism for the Philips e-Alert due to its global reach and reliability, and 98% open rates. 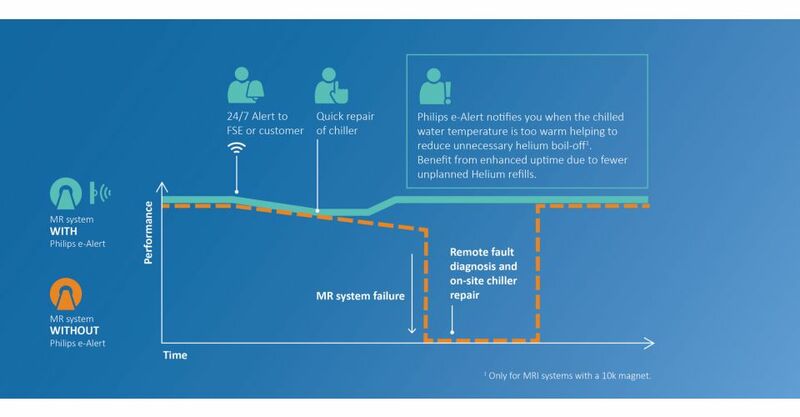 By incorporating SMS, Philips can ensure that their e-Alert devices are able to reach engineers and healthcare staff wherever they are, minimizing any delays in response times. It was a great honour for me to interview some of Philips leading experts at a series of global events this year. 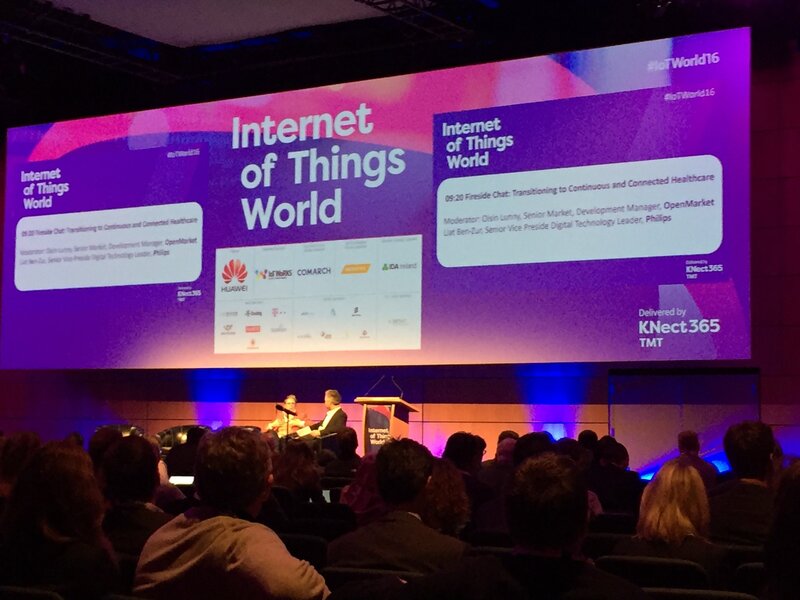 I was delighted to interview Liat Ben-Zur, Senior Vice President at Philips, at the Internet of Things World event in Dublin; and also MRI support engineer John Romero at the IoT Solutions World Congress and IoT Stars events in Barcelona, and also at InfoTech in Qingdao. In these “fireside chat” talks, I asked John about the Philips e-Alert solution, the customer and business benefits and the corporate strategy behind them, and also the decision making processes around leveraging global SMS, as supplied by OpenMarket. Meanwhile Liat spoke passionately and articulately about the need for a joined up connected healthcare strategy. Her inspiring keynote interview outlined how this expanded philosophy of moving from patient care to a broader consumer experience will improve peoples lives, deliver genuine value, and extend healthcare beyond the hospital environment to the home. You can view all of the conference sessions using the video links below, and watch an interview with Barcelona Technology School. You can also read John’s thoughts in Business Insider and his interview from the excellent MEF Future of Messaging Guide. 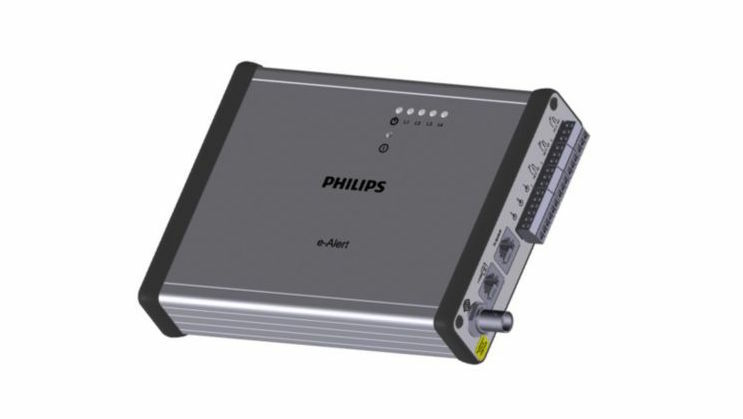 In our age of connected smart devices, and as the Internet of Things becomes a global reality, its good to know that healthcare leaders such as Philips are utilizing one of the most reliable and widespread technologies available for these mission critical situations. The Philips eAlert solution was recently honoured at the highly prestigious World Communication Award in London, winning in the category of “Most Innovative IoT Solution”. 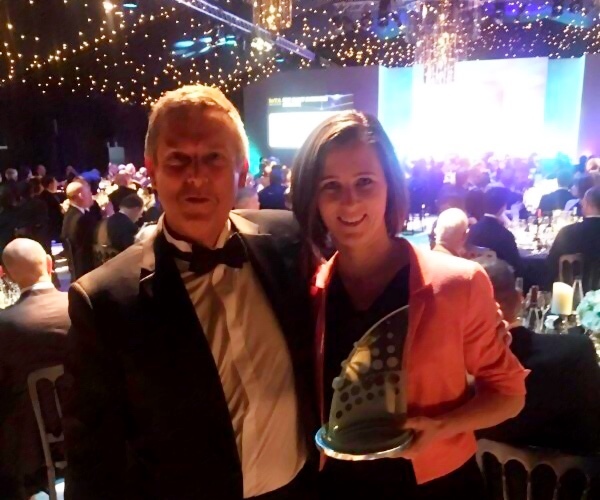 Philips’ Lisa opt Hof, the Global Service Product Manager for MRI systems collected the award with Mark Longstaff, Technology Sector Director from OpenMarket. At OpenMarket, we’re committed to helping our enterprise customers like Philips achieve their business outcomes while providing exceptional experiences along the way. Contact us for more information about our mobile messaging solutions.